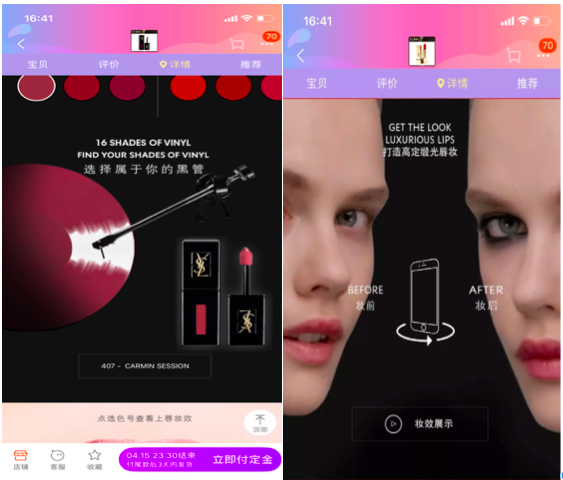 Yves Saint Laurent Beauté made over 30 million RMB ($4.77 million) in sales in its first 14 hours on Alibaba’s business-to-consumer platform Tmall. After 24 hours, the total reached 38 million RMB, beating the previous single-day sales record of 29 million RMB set by Givenchy on March 1. L’Oréal, which owns Yves Saint Laurent (YSL), said demand for high-end makeup is up this year thanks largely to Chinese consumers. “The luxury market is really flying right now,” said Jean-Paul Agon, chairman and CEO of L’Oréal Group. Other fashion brands such as Tom Ford, Chanel, and Christian Dior have all increased their activity in the high-end make-up market, seeing beauty as an affordable way for young Chinese consumers to begin buying from them. YSL Beauté is one of almost 50 brands to join Tmall’s Luxury Pavilion, a sub-section of the site devoted to high-end brands. Current members include Burberry, Hugo Boss, La Mer, Maserati, Guerlain, and Zenith. According to Alibaba, the majority of YSL Beauté customers on Tmall are aged 18-25, with those aged 26-30 making up another 22.4 percent. That’s a younger demographic than shoppers in the brand’s retail stores, whose average age is about 27. “[We] put a lot of importance on the young consumer group, understanding what young consumers around the world are thinking and judging what their demands and preferences are, to provide products that better meet their needs,” said Sebastian Xing, brand director of YSL Beauté China. The initial focus of YSL’s launch was on lipstick, as evidenced in the commercial below, but Tmall said it plans to help the brand grow other product categories such as skincare and fragrances. The commercial YSL Beauté ran for its launch on Tmall. Note the visual references to Tmall’s trademark cat head logo. YSL Beauté continues to experiment with different sales channels, both online and offline. On March 30, they launched a WeChat mini-program introducing a pop-up store in Beijing’s Sanlitun shopping district.